I never really liked when people described Harley Quinn as a “Batman villain” because she really isn’t villainous, well especially not now anyways. 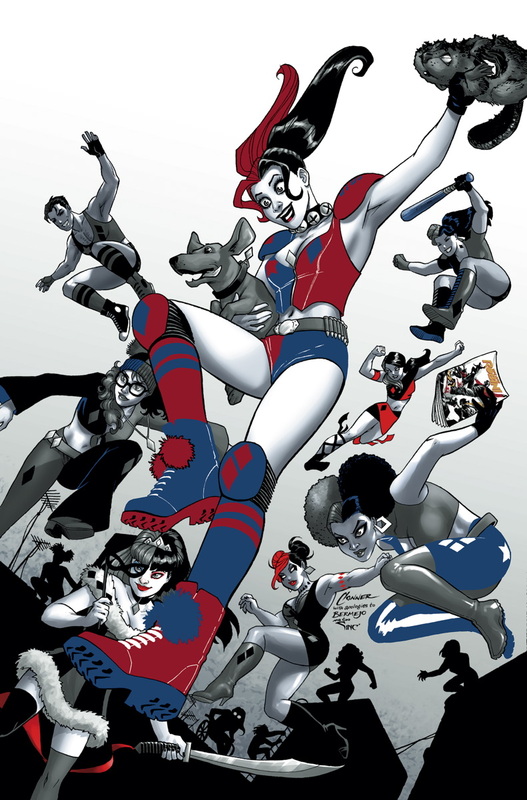 Harley Quinn #17 welcomed the Gang of Harleys, a group of Harley Quinn dressed people who go around protecting the streets, with Harley as the leader. It looks like our girl has gone full heroic now! Spoilers for Harley Quinn #17 follow. So in the issue we see Harley and her group protecting the streets from criminals. Harley even goes to the Mayor to discuss her plans for heroism. The current Harley Quinn run has always portrayed Harley as a caring soul, but now she’s really finding her heroic nature. Although she’s still Harley Quinn, which means she does kill a guy, and blackmails the Mayor into allowing her vigilante group to operate on the streets. So I wouldn’t say she’s a superhero, I guess she’s more of an anti-hero of sorts. Really it’s hard to label Harley Quinn. The thing with Harley Quinn is, she’s been completely desensitized to brutal acts of violence. That obviously has everything to do with hanging around the Joker for so long. Even though she wants to help people, her idea of a hero is skewed by her previous associations with the Joker. This means that she does end up killing a guy who stole a trash can….yepp. Even though Harley may be smart, her mind always has a million different thoughts, she doesn’t always think her actions through. Even just the way the comic book is written, the story jumps all over the place, but it works within the context of the character. In the middle of Harley Quinn #17 we see that Harley has bought some birds from the pet shop, just so she can set them free. When she sets them free they fly back to her, and mimic her to her amusement. Those panels had absolutely nothing to do with anything, but help relay the unconventional and random life of Harley Quinn. However there was a moment in the comic, where Harley actually thought about her actions. 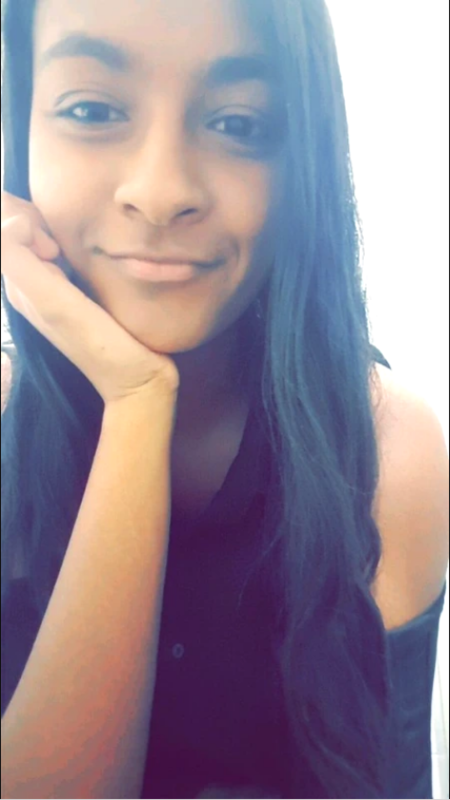 When her date gets arrested, instead of making a scene and killing a bunch of cops, she kept calm and did nothing because she knew she would get in trouble with the Mayor otherwise. Harley is capable of rational thought, just don’t expect it from her all the time. So even though it’s fun seeing the heroic side of Harley Quinn, I hope we don’t see a full on superhero form from Harley Quinn. Harley’s sense of morality doesn’t exactly match with the morality system of most superheroes, so Harley the superhero doesn’t really make sense. Harley is also the type of character that goes through phases, so she’ll probably be over wanting to be a hero soon enough and move on to the next thing. 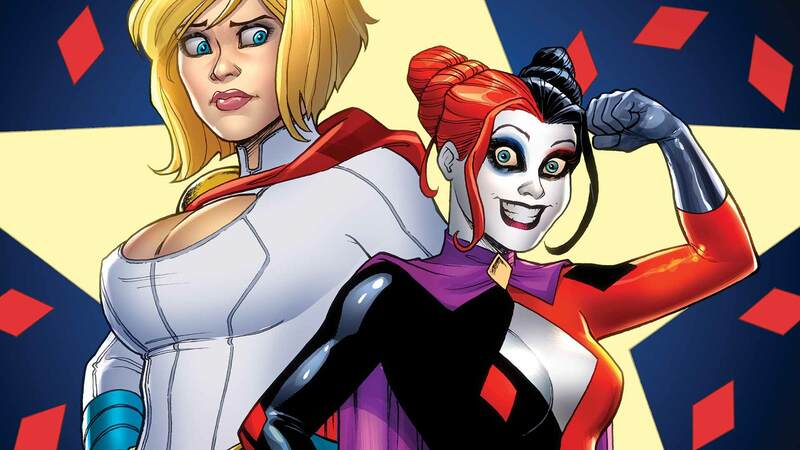 Although we will see Harley Quinn in a team-up book with Power Girl, after their successful team-up in the Harley Quinn book, so we’ll see how much of a hero she is in there. This’ll probably be dismissed as soon as I say it, but what if Harley Quinn is becoming the female Deadpool? I’m sure that statement can be applied to other characters, so maybe she’s A female Deadpool rather than THE female Deadpool, if that makes any sense. She started out innocent, then encountering Joker turned her crazy rather than evil which can be described as a sort of Sid and Nancy analogue, and when she’s not with Joker she’s a force to be reckoned with in her own right. Plus in her own comic there’s a lot of dark ironic humor and some fourth wall awareness. I guess it all really depends on how she’s handled.